I am here today with a project for the Keeping Christmas Blog Hop and the Papertrey Ink Blog Hop. There is a lot to see today so here we go! I wanted to really think about what I wanted to do, so I didn't have anything in mind right away. 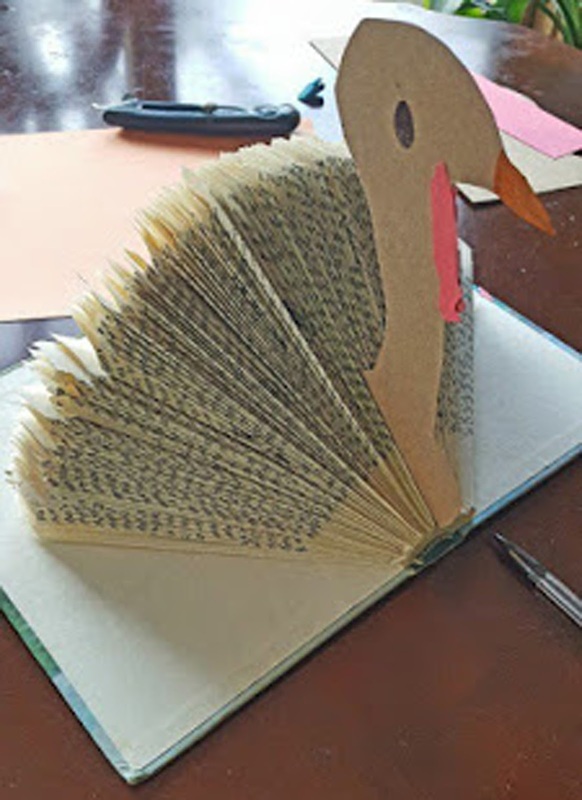 As we were making the short drive to my daughter's on Thursday for Thanksgiving Dinner, I did a search on Pinterest for 3D Papercraft projects. When I ran across one pin, in particular, I remembered a project that my mom had made when I was a little girl out of a book and I knew this was something I wanted to do, only mine would have a Christmas Theme. My Mom's was something like the photo on the left, only it had been spray painted in Gold. What a cute turkey made from a Reader's Digest (if I remember correctly). As I was showing my daughter a few of the pins I had saved, she thought they were super cute. So when I got up yesterday morning, I began working on a particular one she had liked. I started by following the links from the pins to see if there were any folding instructions online. I found a few but I'm going to share some close-ups of what I did so you can see in case you'd like to try one of your own. The first thing you have to do is find a book that is the right size and dimension. This particular book was a paperback book around 7 inches tall and 4 inches wide. If you can find something that is about 150 pages, this will be perfect. Usually, books are a lot more pages than that so you can plan to get a couple of projects from each one. My book was just over 300 pages, so I got two projects out of it. It's pretty hard to keep folding once you get 75 pages (150 sides) done so that's why I opted to make two projects from one book. You can also use magazines for larger projects. Another important consideration is how the pages lay when you open the book and start to work on it. The book on the left will be harder to work with the more pages you fold while the book on the right will be easier because it flattens out. Especially if you are looking through the books at a thrift store or Dollar Tree Store, you will want to check and see how the book lays. If it doesn't lay flat, you will probably want to consider a different book. I know in the past I have seen books at Thrift Stores for 10 cents and more, but not usually very much at all. 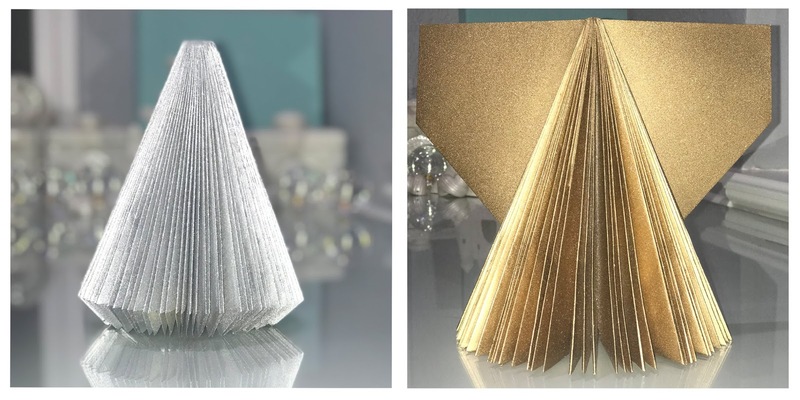 You can also use hard backed books for a different type of decor piece and in fact, I made a trip to my local Dollar Tree store this morning to pick up a few more as I plan to make additional projects with them. Things like old Hymnals would be perfect for this, but I haven't lived here long enough to know where any thrift stores are to see if they have any. I only had one book in my possession that I was willing to part with, simply because I also happen to have it in a hardbound edition. Since everything at Dollar Tree is literally only $1.00, I figured it was worth a look. I found four books about the right size. Two were hardbound and two were paperbacks. They had plenty of bigger books to choose from if you wanted something even larger. Thicker paper will require fewer pages. For now, I'm going to focus on today's projects. I started by removing the front and back cover of my book. The instructions I found showed two ways to fold, so I'm going to show you both of them. A Teflon bone folder was very helpful with this process but my book was about 15 years old and the pages had become quite brittle and lots of times the bottom corners started breaking off. So for my second project, I did a different fold. You want to take the page and pull the corner to the center of the page and fold it with a nice crease. Then you want to do that again which makes your fold about four layers thick. Turn that section just like you would if it was a regular page and flatten/crease it with your bone folder. Do the same thing to each page until you have 150 or so pages. 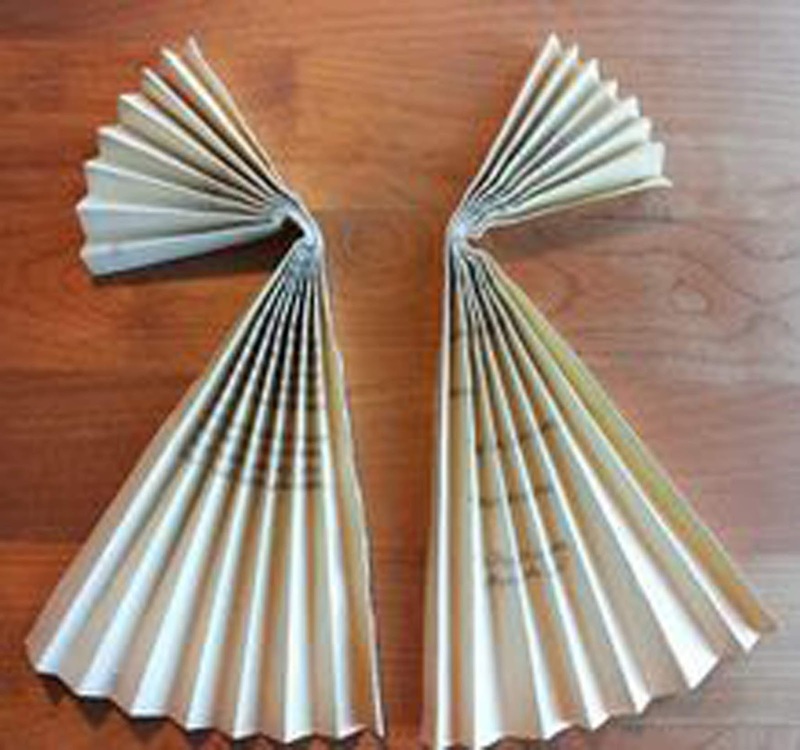 Because I was making an angel, I opted to do the second type of fold where you also fold up the bottom corner, making it completely flat on the bottom. Without the extra fold, it looks like a Christmas tree. I have plans to make one when I get to it, so I picked up two more cans of spray paint this morning for those projects while I was at Walmart; one in gold and one in silver. They didn't have a can of glitter spray in the color I wanted (Iridescent) so I ordered that from Amazon this morning but I'll also be experimenting with some glitter I have while the paint is wet to explore all of my options. This photo shows the one I'm planning to use to make a Christmas tree. By adding an additional fold, you can make yours flat on the bottom which is what I did for my angel. Here is a picture showing how to add another fold for the flat bottom like I have on my large Angel. By folding up this additional corner, (or trimming it off), you can get the bottom flat all the way around. Since I was planning to make mine into an angel rather than a tree, I wanted it flat all the way around so I did the extra fold. This was actually better because my pages were so brittle from age. I am anxious to work with a book that still has nice white pages! If you were ever into scrapbooking, you know that most paper has Lignin in it which is what causes it to turn yellow and become brittle as it ages. If you are a scrapbooker, it's important to know what paper products you are using and whether or not they are Acid and Lignin Free. I knew I was going to spray paint my particular project, so it didn't matter for this project. By now, I am ready to spray paint the first part of my project with Silver Krylon Spray Paint. I like this particular brand because the nozzle has an airbrush type of sprayer which helps to prevent getting drips and allows for more even coverage. I use a large shallow box to spray outside when the weather is nice enough. Today our high temp is 74° outside. It was a little colder yesterday so I worked in the garage with a couple of puppy pads for extra protection in case of overspray. I used sweeping up and down sprays to cover as much as possible between the pages. I also left it flat on the backside so that I could attach the "wings" to my angel on the backside. While the spray paint dried, I worked on the wings. Using my large Scor-Pal, I took a 12 x 12 inch sheet of silver and white cardstock and scored it every ½ inch on the front side. Then I turned it over to the back and scored every inch for the folds that would go in the other direction. My paper was thick enough that even the half-inch folds were somewhat difficult to do but I didn't have anything in a thinner paper that would work. Once it was folded accordion style, I bent it in the center so that I could put Scor-Tape down the center to adhere them together. Laying it in my box, I put a thin layer of Glitter Spray over the wings and the angel's dress then sprinkled it with these tiny gold stars I found at Target earlier this year. This particular glitter spray isn't very glittery, so I was primarily using it as an adhesive for the tiny gold stars. Once that was dry, I attached the wings to the back of my angel using Hot Glue. Next, I took a sparkly ornament made from styrofoam and cut a slice from the end where the hanger was to make a flat spot where I could glue on the head. I fashioned a halo from a piece of gold wire and tucked it in between the wings and the dress, leaving it a bit higher than the head. I also added some iridescent stars one at a time with hot glue all the way around the halo. The iridescent stars are pretty small but the gold ones are teeny tiny. They added a nice touch of gold sparkle here and there. It was pretty messy adding that touch, but once the glue was dry, I tapped off all the excess and put it back into my container. The final touch was the ribbon I tied around the neck to hide where I attached the head. To keep with the light "Frosty" color palette, I chose to create a lightly colored snowflake card with the word Joy on it. I die cut a Bold Borders: Flurries from White Cardstock and attached it to a lightly colored brushstroke watercolor background with some silver and white snowflakes. You can create your own brushstroke backgrounds by mixing white or gold shimmer sprays with re-inkers or watercolors. 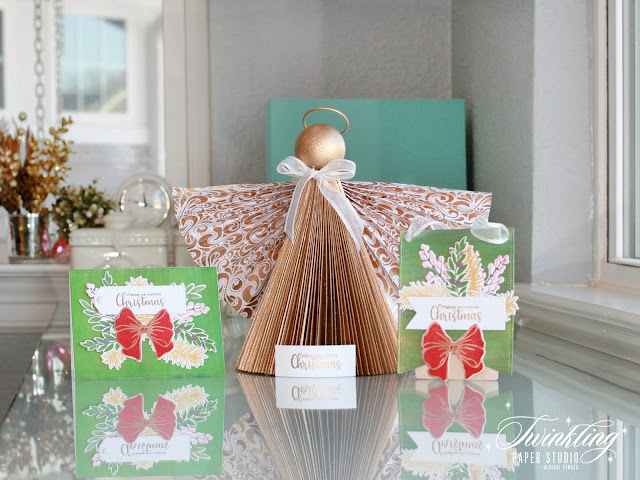 The secret is using a very good quality, super smooth cardstock for this purpose. The Neenah Solar White stays pretty flat and is very smooth but I still run mine through my die cutting machine in an embossing sandwich to flatten it out further. The "Joy" sentiment is part of that cover die set. Once I had my card assembled I took a few photos for you to see the whole project together. My daughter loves this madly and you know I will give it to her for sure. Her Christmas decorations are Silver, Sapphire, and White I am planning to try a few other projects along these lines and will be sure to share them with you when I do. I also wanted to show that you could do a smaller version of the angel for a card front or a tag. In this case, I took one of the small ornaments and cut it in half so that I could put the flat side against the back of the card or a tag. 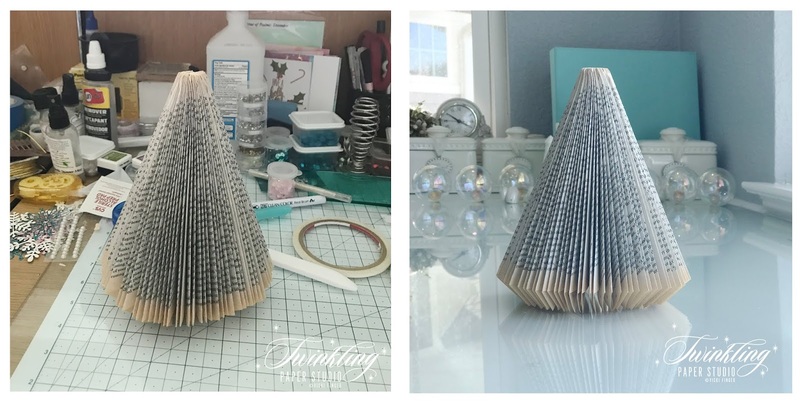 I used the image from Pinterest on the right as my guide for how to do the smaller version with just paper and no books involved. 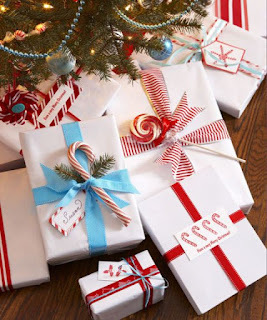 You can make small ornaments as well. My smaller angel was made with 8 x 8 paper but I ended up chopping off about 1.5 inches so it would fit on an A2 card front. You could also make a bigger card or a smaller Angel. To adhere the two pieces together, I used Scor-tape along the long side down the center. and adhered them together. For the wings to spread out, I used Scor-Tape along the short side only and then pressed it into place to the long side. the card base with Scor-Tape as well as then putting the two sides together with Scor-Tape as well. With the double thickness, it is very sturdy. 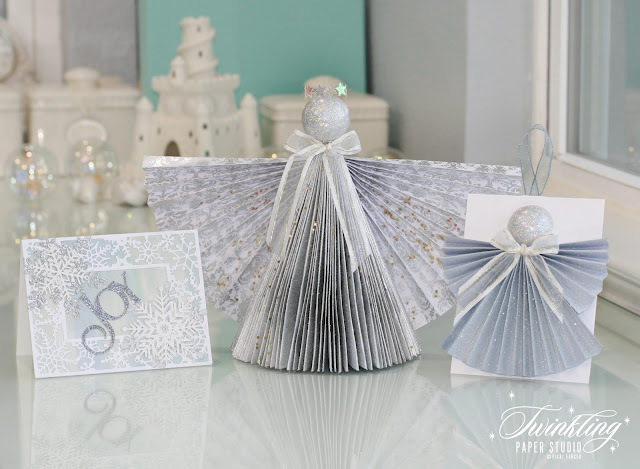 In this picture, you can see some of the glitter detail that I added to the angel before putting it on the card base or tag of your choosing. Additionally, I found these cute angels that were made into ornaments but I was trying very hard to use supplies that I already had on hand which was paper, ribbon, adhesives of various sorts and glitter. 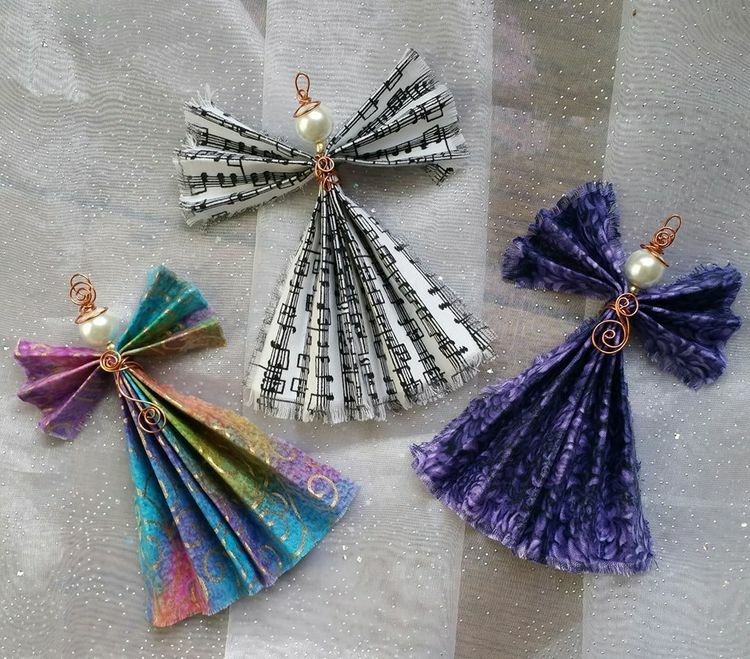 I think the ornaments use jewelry making elements for the hangers and I could really go to town with all the foiled papers and Vellum that I have around. A friend and I used to make Christmas Tree Angels using Battenburg Lace doilies and this was pretty similar to that. I'm sure that I could whip up a tree full of these in no time at all. I am definitely planning to check out the jewelry section next time I am in Joann's or Michaels to see what types of things could be used to make the ornaments. Ribbon always works as well and I know lots of us have that in our supplies. I hope you enjoyed this two for one post. I always try to include as many details as well as my thought process for my projects so you can figure out if they will work for you. Find an idea and adjust the instructions accordingly for the way you like to work. Now I'm off to fold up another book to make an angel for my best friend and one for myself as well. Then there's the tree that is already folded up and ready to be spray painted and decorated. Here are all the stops along the hop for the Keeping Christmas Blog Hop that we do on the 25th of each month excluding December. I can't wait to see the other ladies' projects. Thank you so much for stopping by today to see my projects! I hope you'll come back often to see other projects that I share. I am happy to say that except for just a few cards that I still need to mail, I am completely finished with my Christmas Cards and have sent most of them on already. THIS POST HAS BEEN EDITED TO ADD CONTENT! Hello everyone! I am here today with my last project for the Altenew Educator Certification Program Level II Classes. Once this is submitted I will be assigned my class project for my "final" exam. My project for today uses very simple masking to create the look of a flower with a lot of foliage behind it. I used Versamark to stamp and heat emboss all of the outline images in this set and that can get super tricky as your mask will leave some sticky residue on your image, so you must use lots of powder between each stamping to make sure your image stays nice and clean. I also did mine on Arches Hot Pressed Watercolor Paper because it is smoother for heat embossing and stamping. Because I have RA, I have a difficult time cutting masks by hand, so I kept my card very clean and simple so I only had to cut one mask for the bloom. I love the bloom and the leaves in this set, so I still stamped the additional layers but after that was done I took a plain water brush and blended all the color around. The leaves first and then the bloom. It just makes it so the lines are softened out a bit and the color blends a bit more. For my leaves, I used Sweet Leaf and Just Green Inks and the bloom was done in Rose Quartz and Pinkalicious which are all from Altenew. I wanted something very soft for the bloom which is why I chose to blend everything out with a water brush. It gives it the look of watercolor without the work. I'm not very good with watercolor and I haven't had much time to practice this year, but I have a couple of classes that I plan to go back and revisit with the colder temperatures setting in. I did not get a very good picture of my card this time before the sun moved (with the shorter daylight hours) into my window, so I apologize for the image quality this time around. For a touch of sparkle, I added some Ballerina Pink sequins with some gems in the center and also some Tonic Nuvo Shimmer Pen to the bloom and leaves. Thank you so much for stopping by today and checking out my project. I hope you'll come back soon. Wishing all of my American friends a very Happy Thanksgiving weekend. I'm both dreading and excited to see what the Black Friday or Cyber Monday Sales bring to us this year. 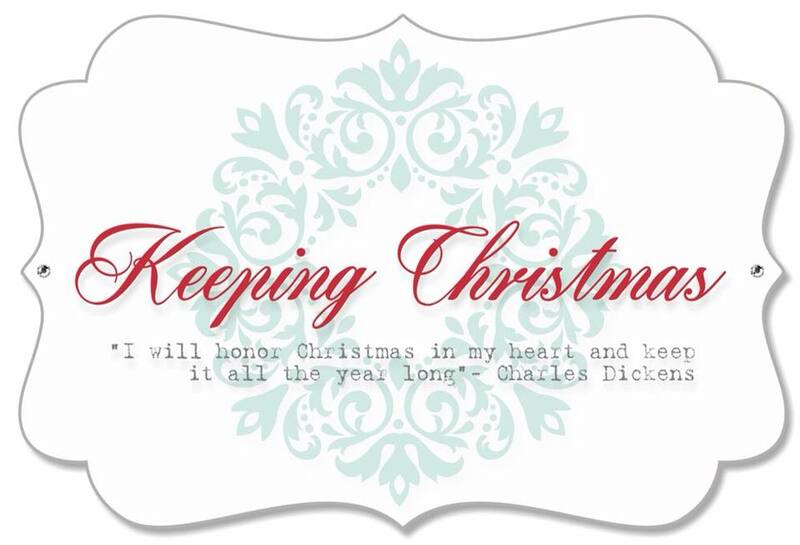 I have sent about 80 Christmas Cards today and still have a few more to make to finish up for the season plus I have the Keeping Christmas Blog Hop and the Papertrey Ink Blog hop on the 25th so I'll be back soon with more projects for you to see. *Edited 11/22/2018: So after sitting on my desk for a few days, I decided I really needed more color and contrast in my focal image. Using my stamping as a guideline, I went back in with my Pink Zig Clean Color Real Brush Marker and added some additional color and details to my water-brushed image. I like this much better. I would encourage you to try adding some color if you aren't satisfied with the way an image turns out. In my case, the greens seemed very vibrant while the bloom was too soft and pastel to compete with the leaves. I'm much happier with the way the bloom looks now. Hello everyone! 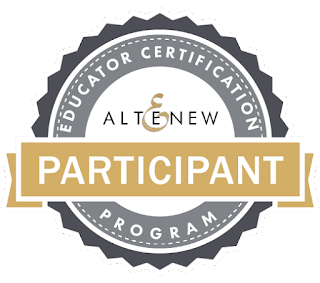 I am back today with another project for my Altenew Educator Level II Certification Classes. This class was all about Magical Marker Techniques. I always love it when I find a new way to use products that I already have and this class showed lots of ways to use Alcohol Based Markers. My particular project was done using Alcohol Markers with Stencils to get a really bright and vivid background for my card. As always, there are a few birthdays coming up soon and I needed a masculine card in particular for this occasion. I need a feminine one as well, but I'll have to work on that another day. For today's project, I started by using a 4.25 x 5.5 panel of Cougar Digital White Cardstock which is a #100 weight. It is super smooth and I love how bright the white is. I also like Xpress-It Blending card, but it is much thinner and I wasn't sure how well it would die cut for a background panel, so I stuck with the Cougar Digital White Cardstock. I also pulled out my notebook that I keep all of my stencils in and had a look through to see what I could use with my markers to make a masculine background. I just slip them down inside a page protector with a label stating the manufacturer and how many stencils are in the particular set. In this case, I chose the Perfect Plaid Stencil Collection from Papertrey Ink. I sat down with my drawer of blue markers and a scrap of cardstock to see which colors I would use and to make sure the tones all worked well together. I used B32 - Pale Blue for the widest stripe, B23 - Phthalo Blue for the skinny three striped line, B24 - Sky for the single middle width stripe and finally B39 - Prussian Blue for the darkest stripe. In some cases, I rotated the stencil 90 or 180 degrees to get the reverse look to create the plaid. I love how bold and bright this turned out and I think I will be getting more uses out of my stencils from now on. I enjoy using them, but I don't often reach for them automatically. I keep them in an easily accessible place so they are handy, but they aren't right at my fingertips like many of my other supplies are such as inks. I love the look though, so I know you'll be seeing more of them in the future. Once my background was colored in with my markers, I let it dry completely before heat embossing the "Sending" sentiment directly onto the panel. I actually triple heat embossed this with silver embossing powder so that it would stand out more from the background. Using a strip of Dark Indigo Cardstock, I stamped the "Birthday Wishes" sentiment onto that using the same silver embossing powder and adhered it with a skinny strip of foam tape. This is a super clean and simple look (even with the busy background) and also very graphic which guys always seem to really love. Isn't this just a fun and graphic look for a card and imagine all the possibilities with all the various markers available for this look. There are also multiple ways to rotate the stencils for a variety of different looks. I hope you all have a great day and come back soon to see my next project. I'm getting adjusted to less daylight in the winter months and also the light in the sky is coming from different angles than it did over the summer so I have shorter windows for photographing my images. But, I'm working it out. I just really like to have as much natural light as possible and not use flash, so it's taking a little bit of adjustment. Mid-morning continues to be my favorite time with the best light. Thanks so much for stopping by today! I hope you'll come back soon. Hello there! Today I am back with my next project for the Altenew Educator Certification Program. This class is "Impressive Heat Embossing" and I got to do one of my favorite techniques which is watercolor over a heat embossed background. Today's project is a special one because it's a card I made for my best friend who's birthday is Tuesday, November 13th. Gloria has been my best friend for many years. I met her when we lived in Frisco, TX and I think she moved there in 2000. We became friends through a Creative Memories Class that I taught at my next door neighbors house through another of my friends, Xochil. It wasn't long before Gloria and I were "thick as thieves" and through the years we've become even closer. Even though I spent 8½ years living in Oklahoma, she still came to visit me and when I came here to see my daughter and grandkids, I would make sure to see her as often as possible. Several times over the years that I was gone, we would still get to share Christmas and Thanksgiving meals. My daughter and son-in-law are gracious hosts and would always let me invite her to the special family dinner that we traditionally hold on Christmas Eve. It was hard being away from each other during the years in Oklahoma so as you can imagine, we see each other as often as possible now that we're closer to each other. I don't know how much you all know about the Dallas area, but a 40-minute drive is nothing. She still lives in the same house in Frisco still so it's about an hour for her to drive here from her house. I go to Frisco pretty often as two of my doctors are there. But I'm normally running around doing other tests and don't often get time to visit when I'm there as she is at work. We've had at least 1 weekend together every month since we've moved back to Texas and she is the most frequent visitor in my guest room. We spend a lot of time making cards and a lot of time outside on our back deck, sometimes deep in conversation, and other times just relaxing. We watch movies and hang out. All of this is just to say I wanted to create a beautiful card for her birthday and heat embossing wows her every single time. I chose the Simon Says Stamp Rebecca Lace Background Stamp for my card, which is one of my absolute favorites! I stamped the image in my Original MISTI onto a 5 x 7 piece of Fabriano Artistico Extra White Hot Pressed Watercolor Paper. This is a very detailed stamp with fine lines and it can be hard to get a good impression, so I inked it up with Versamark two times before adding Antique Gold Embossing Powder to it. I could see a place in the center of the image where I did not get it inked up well the first time so rather than trying to fix it or cover it after the fact, I decided to just ink it twice to make sure all the areas were covered with Versamark. I inspected it carefully before adding the embossing powder and I got a perfect image. This was somewhat of a surprise since I'm kind of out of practice with heat embossing lately and forgot to use my powder tool first. So I breathed a huge sigh of relief when I got a clean image. I wanted to use a Wet-on-Wet technique for the background so that my colors would blend and move seamlessly. I chose to use Altenew Re-inkers in Puffy Heart, Coral Berry, and Maple Yellow. After wetting the entire panel of paper, I started adding a diagonal area of Maple Yellow from the upper left to the bottom right as I wanted the other two colors from each side to blend into the yellow. I let that dry a little bit but while the paper was still damp, I added Coral Berry with a good amount of water to the upper right portion of the panel. Next, I added Puffy Heart to the bottom left of the panel and let all of those colors dry a little bit. Once the excess water was evaporated, I went back into each area adding more intense color while the panel was still damp to kind of brighten it up a bit. Once all the excess water was evaporated again, I sprayed it with some Iridescent Gold Shimmer Mist from Tattered Angels which helps the blends be an even smoother transition from color to color. I set it in my window sill to dry well. With the shorter winter days, the sun comes in through the window much earlier and at the time, it was in full force in my window so it didn't take very long to dry. Once the panel was dry, I lined up my WPLUS9 Stitched Rectangle Die (from the Gift Card Layers set) and die cut it where I wanted. I adhered it to a top folding Card Base made from Stampers Select White Cardstock. I chose the Simon Says Stamp Big Happy a word die and cut it from Gold Foiled Cardstock. Then using a sentiment from the Papertrey Ink Painted Petals Stamp Set (2016 Anniversary Set), I stamped Birthday Wishes onto a strip of black cardstock with Versamark and heat set it with Antique Gold Embossing Powder. 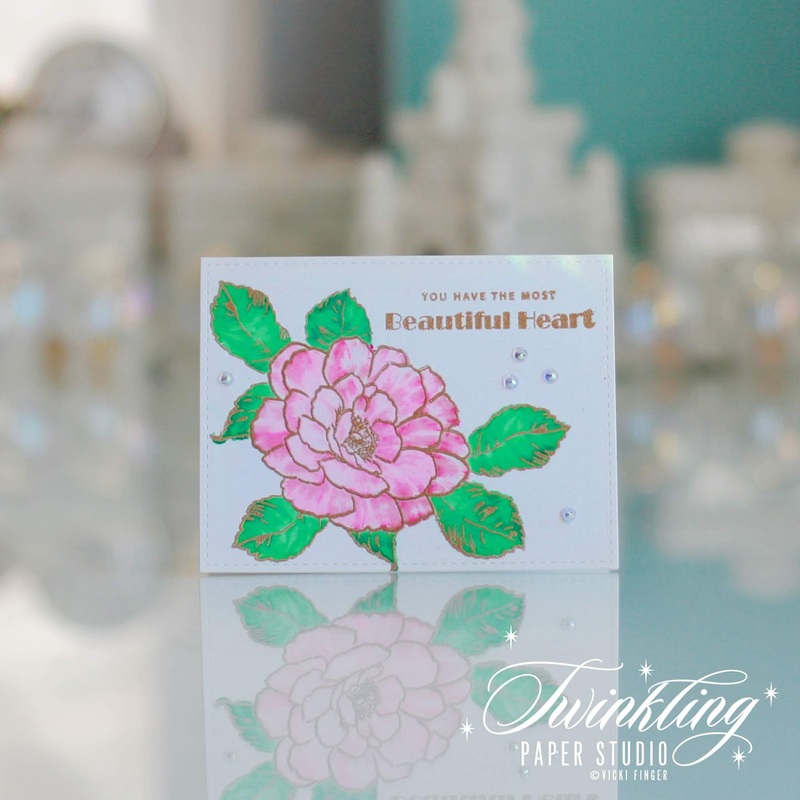 I used some pink pearl gems from Hero Arts to embellish the card which finishes off my project. I love how this card came out and I know she will love it also. We aren't celebrating her birthday until next weekend, so I'm saving it to give to her then. I hope you all enjoyed my project for this class and that you'll give it a try. Wet on Wet backgrounds are among the easiest of watercolor techniques to do and no two cards will ever look the same. Hello everyone! 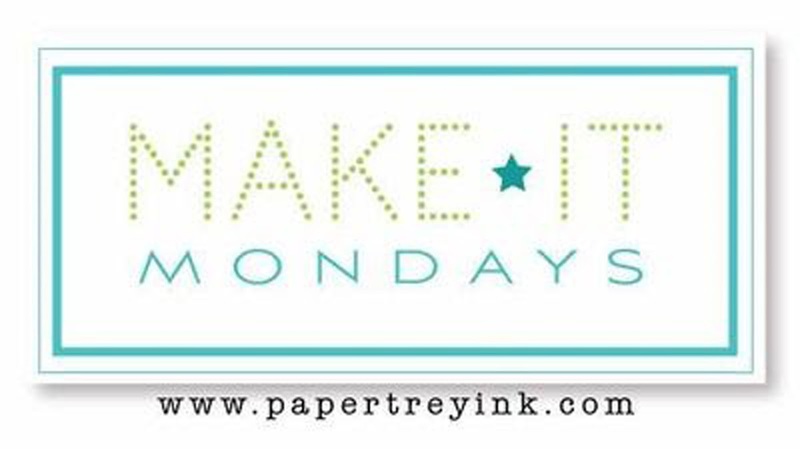 I have several projects to share with you that are a result of this week's Make It Monday #341, Painted Brushstroke Backgrounds by Dawn McVey. I love this technique, but I don't have acrylic paint like what Dawn used, so I had to improvise. I thought about going to buy some, but I decided to try using what I had on hand first and see if I could make it work. I did, just not quite in the same way. Acrylic paint dries very quickly and doesn't over saturate the paper so I needed something that worked in much the same manner. I wasn't really able to retain any whitespace like Dawn did, but I am still really happy with my results and I am always tickled pink when I figure out a work around. I have lots of different watercoloring mediums on hand and selected one that if I wasted it, was not going to be a big deal. You can find online or often at Hobby Lobby some Sargent Art Watercolor Magic which comes in a big 8 oz bottle. The 2 bottles I have are Pearl (White) and Gold. Both have the pearlized finish. By adding drops of re-inker to the white and occasionally to the gold as well, I was able to create custom colors in Papertrey Shades. I did not add any other liquid to the mix, only dampened my brush (1 of the brushes in the Tim Holtz/Ranger Pack) and removing most of the water from that, it gives a brush stroke look. Because the solution was about the same consistency as Acrylic paint, this worked. It's important to note, that I did NOT use watercolor paper for this, just white cardstock. I did try one panel of watercolor paper, but it was unsuccessful. These are just a few of the background panels that I have to work with after all the cards I've made. This card and the one below are the same card. The colors showed up differently depending on if they were facing the evening light last night or my camera flash. I think that is a lot of what I really liked about these. With the pearly white watercolor, it gave the backgrounds a ton of shimmer, shine and sparkle no matter what angle you are viewing it from. The same card facing slightly toward the setting sun. I like taking my pictures early in the morning, but I don't always have a choice. This background was made using Blueberry Sky and Dark Indigo with the white watercolor. I love how the white showed up as a silver color. My daughter's Christmas Tree is White, Silver and Sapphire with white lights and I was trying to use those colors as experimentation for the banner I'll be making to hang on her fireplace. Lately, I've been experimenting a bit with other white cardstock and while Stamper's Select white remains my top all-purpose card stock, for some things I like to use Cougar Digital White in the 100# weight. It's not coated, but it is very, very silky smooth. There is a big difference in the way it feels vs. the Stamper's Select White. I still use PTI's Stampers Select White for all of my card bases and much of my stamping, but I do love the Cougar Super Smooth when I want really smooth cardstock for Copic coloring or other techniques from time to time. This is one of those times. It is Bright White and so super smooth! It was perfect for this technique because after adding the brushstrokes to the paper, it was still silky smooth. It actually held the brush strokes very well because the consistency was much thicker than normal watercolor. I was also able to layer by letting the color dry each time and them coming back in with additional layers of white or gold. To warm up the gold a bit, on a couple, I added Berry Sorbet to the Gold Watercolor and on some others a bit of Classic Kraft. One results in a warmer gold while the other results in a more beige-y gold. For my first card, I chose to use many of the same products as Dawn including Tag Sale #12 and Spruce & Sprigs. I also used the "Joy" die from Lizzie's Bold Borders: Flurries. I nearly messed up my first card by using a liquid adhesive to apply the word so I got smarter on the next projects by running a strip of cardstock through the Xyron and then die cutting it. That made it super fast and easy. I'm thinking I definitely need to stock up on my 2.5-inch Xyron Refills. I only have one spare at this time, so I'll need to do some couponing to get some additional refills. I have several of the 1.5-inch on hand so I'm good there depending on the size of the sentiment I'm planning to use. I die cut the front panel with the same stitched rectangle I almost always use. It's the largest one from WPLUS9's Gift Card Layers dies and it cuts a full A2 panel with crisp, clean edges and stitching detail. Once that was die cut, I cut Tag Sale #12 from that panel and adhered the negative to my cardbase. I also die cut a piece of fun foam from the same die to go behind my "ornament" and provide a bit of dimension. I used liquid glue to adhere those two pieces as it is really hard to apply any kind of tape runner to the foam. Even score tape is a bit frustrating. As always, I used Ranger Multi Medium Matte for my liquid adhesive. 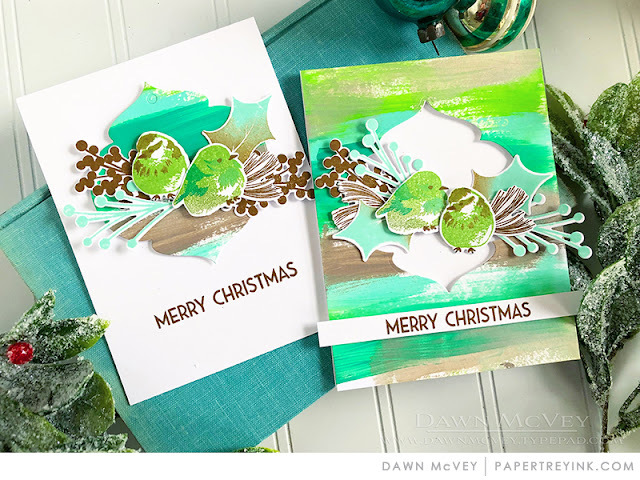 I die cut multiples of the Spruce and Sprigs Elements from Stamper's Select White Cardstock and stamped them using my MISTI Stamping tool with primarily Papertrey Inks. It's always good to have an extra die cut or two just for the purpose of stamping and making sure they line up right when you are using the negative as a place-holder. I know I will use at least one of each during this process of lining things up right except for the rare times when I nail it the first time around. I stamped some of the holly leaves in Pine Feather while I stamped others in New Leaf. I added a bit of depth and dimension by sponging in a darker color where the base of the leaves and the center line are. I tried Pinefeather, Olive Twist, Ripe Avocado, and even Fresh Asparagus from Gina K Designs which is one of my favorites for this purpose. I think you can choose based on what the primary color you used or want is. I tried adding some Ripe Avocado to the Pinefeather and that didn't really do much by the time the ink dried. So just play around to get a color combination that you like. Now as you know, once I get started with a technique that I love, I have a hard time quitting. When I saw how these brushstroke panels dried, I had to try them with Lizzie Jones' Bold Borders: Yuletide. I absolutely love this die and I have tried it with several kinds of papers so I just had to try it with these! I'd have a hard time picking a favorite color combination. This was Vintage Jadeite with New Leaf and Gold Watercolor. I used Red Metallic Sequins with gems in the centers for this card. I love adding little gems to my cards and I have a good selection of sequins as well. The colors I used for this were Dark Indigo, Vintage Jadeite, New Leaf and Gold with no additional color to change up the shade of gold. Sapphire Metallic Sequins with Gems provided the finishing touch. The holly leaves for these cards are from Pretty Pink Posh called Festive Holly Dies. I like these because they have that same stitching details as the cover die. I used the insert to cut my title from, again run through the Xyron before die cutting which is by far the easiest method of adhering. Since the backgrounds are watercolor, the wet adhesives can damage the card's surface/finish. This last card is probably my favorite because it is pink and purple with gold and bling! All of the backers for the cover die are shimmer cardstock or shimmer vellum. This particular one is the same color as Gina K's Plum Punch and I used Metallic Sequins as well for this card. 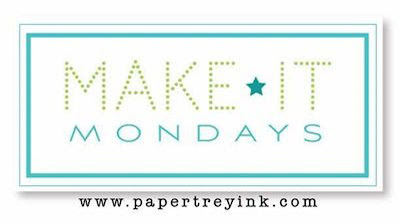 I hope you enjoyed my project for Make it Monday and all of the bonus cards I've shared with you here.